The little-known secret that most tourists don’t know about and that many travelers like to keep to themselves is that fact that most of the best Caribbean Islands to visit are not those found in that linear line of islands stretching southward from Florida’s southern tip, but rather are found hundreds of miles away, dotting the coastline of Central America. Here — far from the mega-resorts, conga lines, watered-down drinks and ports-of-calls — you’ll find the much less developed and tourist-light island that make up the Belize Barrier Reef, the diving centers of Honduras’s coastal islands including Roatán and Utila, Colombia’s Providencia Island (which is actually much closer to Nicaragua), and Panama’s Bocas del Toro Archipelago. One of the most well-known of these Central American islands is Nicaragua’s Corn Islands (Big Corn Island and Small Corn Island), whose total land mass is barely five square miles, and whose lack of development, relative difficulty to travel to and natural beauty have been causing travelers to seek them out in droves over the years for a chance to experience their own Caribbean version of The Beach (minus the mass killings). The NY Times recently traveled to Little Corn Island, and described the relative unease of getting there, part of which is the reason for going in the first place. The fact that we could get so badly lost on what we had been told would be a 10-minute walk is typical of Little Corn, where electricity is scarce and most nights are reserved for board games, books and the occasional bonfire. 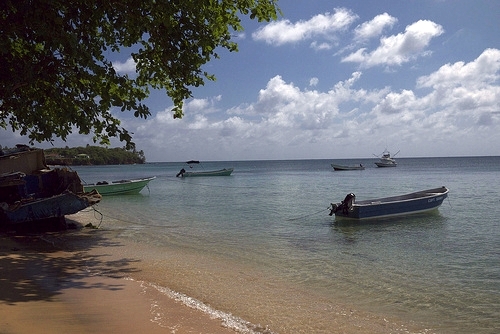 Though only a puddle jump from the Nicaraguan coast, the Corn Islands — Big Corn and Little Corn, a half-hour boat ride apart — are among the few Caribbean destinations that are relatively unknown to international tourists. While Big Corn (population about 6,000) has just one road, which loops the periphery of the 2.3-square-mile island, Little Corn, where the year-round population is less than 1,000, is completely free of cars. The only “road” is a well-trodden foot path through a jungle that’s home to chicken-eating boa constrictors, raccoon-size iguanas and sand-colored crabs that bolt underfoot. The island’s only town has no name. Once there, they found a car-free island home to only about 1,000 people, where you can get PADI certified for little more than USD$300, and where a hodgepodge of Nicaraguans and Italian ex-pats have opened up sparse drinking outposts and Italian restaurants stocked by homegrown groceries. And forget about frequent run-ins with pasty weekenders from the north. Chances are, here you’re more likely to spend more time scheming to stay longer than jockeying for space on the beach with other tourists.